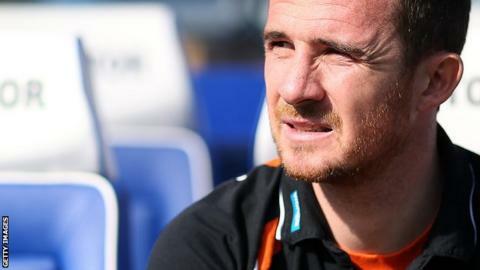 Caretaker manager Barry Ferguson says Saturday's 2-1 defeat by Yeovil has put Blackpool back in relegation trouble. Blackpool are 20th in the Championship and six points above the drop zone. "We've got six massive games [left to play]. I reckon we need another two or three wins to be safe," said Ferguson. "It's up to them [the players] now. If they want to be playing Championship football, then great, because I want to be involved in the Championship. I don't want to be in League One." Former Scotland captain Ferguson, 36, had been pleased with the progress made by the Seasiders in recent weeks, but admitted his side were "back to square one" after a disappointing display against the division's bottom club. He told BBC Radio Lancashire: "It was a pressure game because we could have probably put them out of sight if we'd won. Maybe it got to them. "Football's always been about pressure. Wherever I've been, whenever I've played and now in the managerial side of it, the pressure's always on and I enjoy it. "I need to work out a way of trying to take away the pressure from the players because it does affect them at times." Blackpool host Derby on Tuesday.